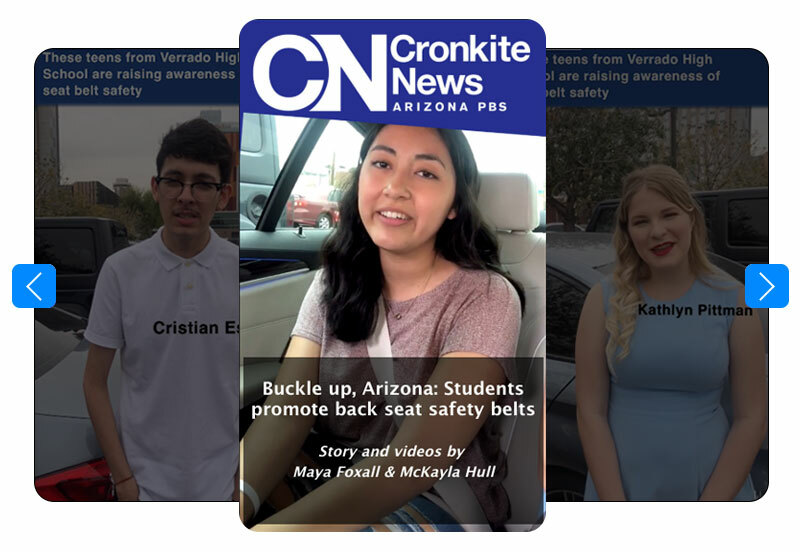 BUCKEYE – A communitywide campaign to promote seat belt safety among young people, spearheaded by Verrado High School senior Ambar Silverio, could lead to a state law requiring back seat passengers to buckle up. “It’s really hard to pass a bill, and a bill can die for a lot of reasons,” said Erin Eisen, who teaches the Advanced Placement government class. Her assignment for her students was to explore how politics are a part of the legislative process. Silverio created the Buckle Up V-H-S campaign after several students were involved in car accidents. During a monthlong campaign, she worked with classmates to get students to pledge to buckle up when riding in the back. The group also worked with Buckeye Police Department to get donations and use a portable traffic sign to get the message out to drivers. The campaign also got the attention of a local politician. Silverio and her classmates now are working with Sen. Martín Quezada, D-Phoenix, to create a bill that would require the use of rear seat belts. They hope to have the bill introduced during the next session of the Legislature. Next year, banners will be hung on light poles in Verrado High’s parking lots, encouraging schoolwide seat belt safety. The students hope that the campaign will have a lasting impact.